The flow chart shows how bricks are produced, and delivered to customers. 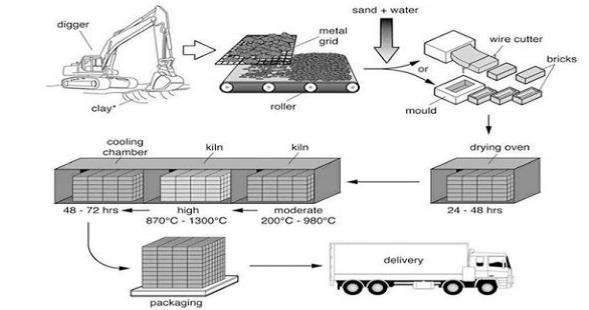 Overall, there are seven stages in the whole brick producing process beginning with clay exploitation and ending with the delivery of the bricks to the sales. At the first stage, clay is dug up by a big digger. To get rid of the oversized pieces, clay is placed on a metal grid and smaller pieces drop onto a roller. At the next step, sand and water are added to the clay, the bricks are shaped by a wire cutter or a mould and then moved to a drying oven for 24 to 48 hours. Those bricks are heated in a kiln at a moderate temperature(200c-980c) and then in a separate kiln at a higher temperature (870c-1300c). Before being packaged in the sixth steps, the bricks are treated in a cooling chamber for 48 to 72 hours. The entire bricks producing process concludes after the bricks delivered to customers. While this is correct, digger is also used in British English.